We have been working on a New Winch and took it out for a test run Glinks Gully last week, we decided to use a kite to give the winch a better working load for our testing as kites are harder to pull in than kontikis. I didn't expect to catch snapper this early in the season so I baited up the 65kg Dropper Rig with small mullet baits hoping for a few gurnard. The wind was gusting to 35 knots and the Nighthawk Kite we were using was pulling over 10kgs. We needed a five liter float half filled with sand to keep the hook section in the water, and used two 8 ounce sinkers front and back of the hook section on the 12 hook set. 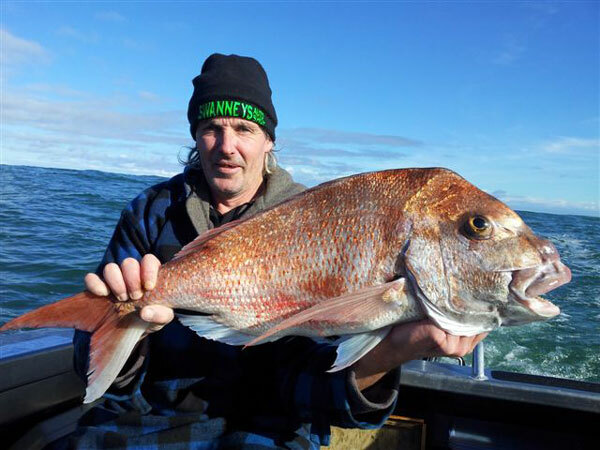 Photo Above: The snapper are in on the west coast, I caught five snapper and a couple of gurnard on a single 12 hook set with a kite dropper rig last week. The gear powered out to 1300 meters offshore in around 15 minutes. I was going to put a second kite on at 500 meters back from the first kite, but as we were testing the winch decided against it. It was the biggest tide of the month and as there were no boats around I figured that letting the line sag into the strong long shore current would give more load on the winch than two kites. When it was time to haul in the wind was howling and the pull on the line before starting the 240 watt winch was up to 15kg. Around 600 meters of line was in the water and subject to the strong current, the line had bowed in the strong long shore rip as we had hoped. It took 25 minutes to haul the line in and you certainly would have needed leather gloves to do it by hand! The new winch handled this increased load with no problems and was drawing only 10 amps of power during the biggest gusts while hauling the line up the coast into the rip tide. It could have easily handled double the load we had as it is rated up to 20 amps draw. During hauling the line popped clear of the water while the bottle was at around 700 meters out and the pull from the kites reduced from over 20kg to 16kg. When we hauled in the hook section I was really surprised to find we had caught five pan sized snapper along with the expected gurnard. Usually the snapper are not in close this early in the season on this stretch of beach. Not only will this winch be the most powerful one on the market, it will also be extremely compact and energy efficient. 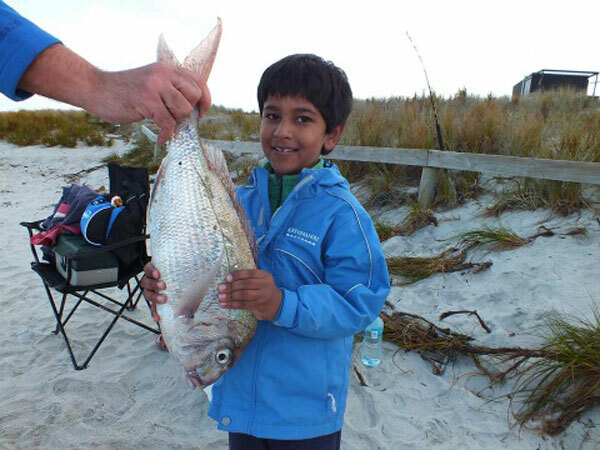 Kite fishing is the cheapest way of getting a longline out and if you use a Kite Dropper Rig it is a very efficient way of fishing through the high surf and strong longshore currents on the west coast. The best fishing season for kites and kontikis is already from October through to May. 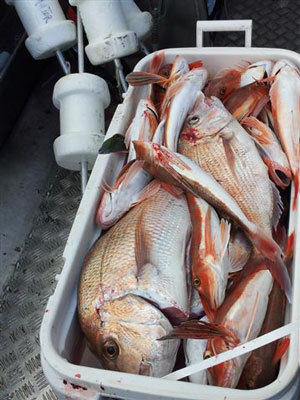 The best chance of catching really big snapper is from October to December. Pocket Sled Kites that are small enough to run from rods and reels spooled with 15kg line right through to large kites that will pull 100kg 25 hook longlines out in as little as 5-7 knots of wind are available from our online store. Paul's Fishing Kites are renown around the world for their quality, tackability, stability in gale force winds and power in light winds. No other fishing kites will give you more trouble free fishing days. Be the first to get your kite up in light winds and the only one not to crash in gales. Check out our Full Range of Fishing Kites and our Full Range of Kite Fishing Rigs below. Rhys, Chad, Ian and myself headed up to Muriwai in time for a sunrise set with the ShoreThing Kontiki Dropper Rig. By the time we got to our spot and set up and set our ShoreThing first light was just starting to appear on the horizon. The sea was as flat as a mill pond, but we could tell that there was a strong rip. We baited up with semi fresh mullet from the local supermarket as my local fishmonger was sold out. I knew the bait wasn't as good as usual but hoped for the best regardless. 45 minutes later we were hauling in. 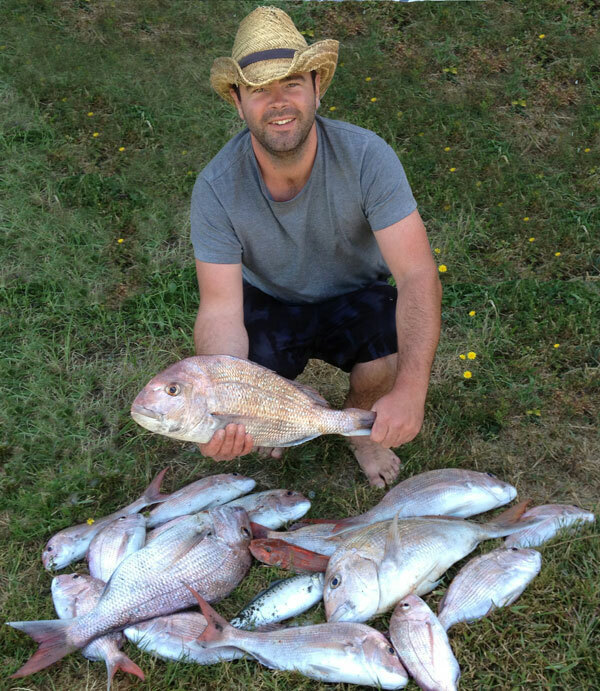 Our first set had a couple of 35cm snapper, and three small kahawai. The snapper were put straight on the gas cooker for breakfast and the kahawai were cut up for bait and used on the next set. What a great outcome that brought us! We caught 16 good sized snapper on 25 hooks! We had enough bait to do one more set with the supermarket mullet, so out that went for the final set for the day. Unfortunately the supermarket mullet wasn't anywhere near as appetising as the fresh kahawai so we ended up with only another two snapper to go home with. Regardless, the first two sets were what made the day for us. 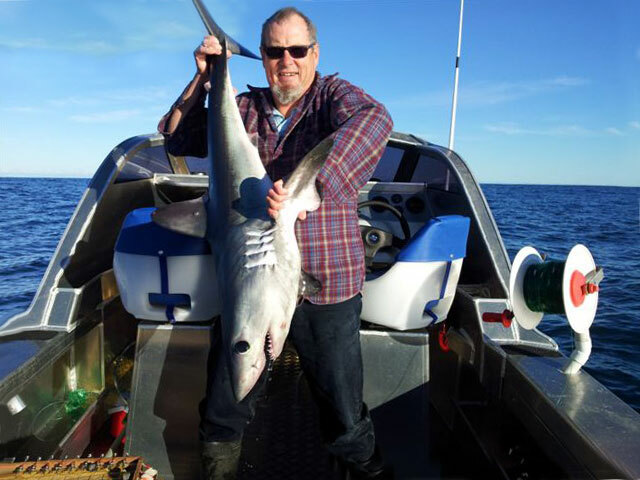 We spoke to a couple of guys who were fishing the same day as us that had mixed results. The first guy we spoke to had an underpowered kontiki that didn't suit the strong rip, so his kontiki ended up washed back onto the shore. The second group of kontiki fishers we spoke to did manage to get their gear out but went home with only three smallish snapper. There is a lot to be said for fresh bait as well as getting your baits out there in good condition. Another great day out with the ShoreThing Kontiki Dropper Rig. The fishing around Wanganui has been outstanding the last four years since I have returned home from Auckland and Whangarei. 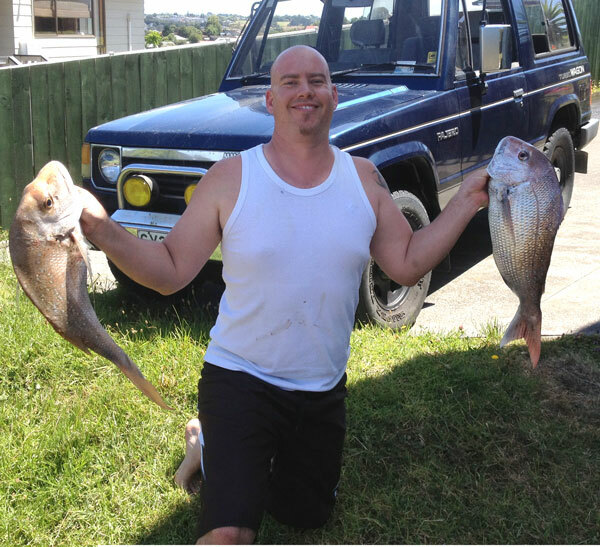 We fished about five kilometers off the Wanganui bar in 28m of water with your Two x 25 Hook Boat Longline System. The baits were a mixture of salted kahawai, salted squid and frozen couta (or motor scooters as we call them) so we had good tough baits but nothing too flash. A great tip for easy hauling the line in is to always lift the down current dropper and take the grapple off then leave the drop line and float in the tide. This does two things that really help when hauling. As I was doing this I could feel something really huge pulling on the line while I removed the first grapple. We went to the other end and retrieved heaps of gurnard up to 50cm and nice 14lb snapper and the this mako shark. Looking down we couldn't tell at first whether or not it was a huge kingi. It had a single wrap of setline knot section around its tail and a cut trace lip hooked. I was only just drowned and luckily for us, had very little fight left. You would wonder how to lip hook something with half its teeth on the outside of its mouth but that is a testament to the PFK 5/0 hooks and target wires. 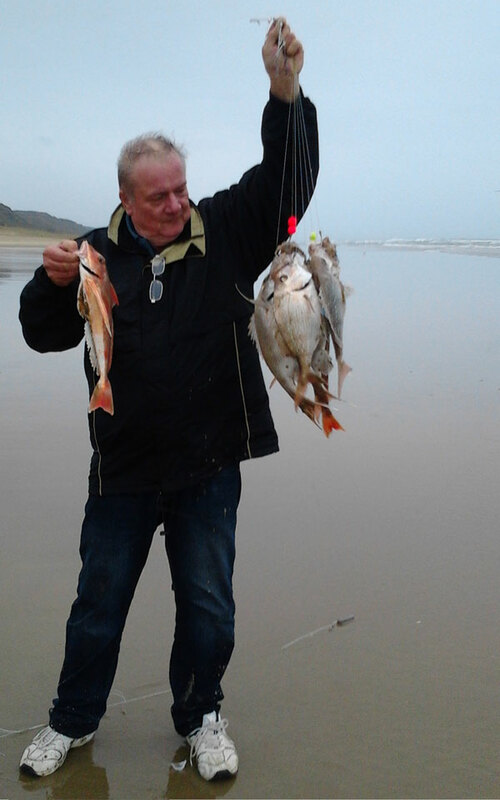 Needless to say the other set came up with plenty of pan snapper up to 12lb and good gurnard. The white meat of the mako pan fried well. What was smoked had a good taste but no texture, so I would still prefer smoked blue cod or smoked gurnard. Over the day we caught 12 nice sized snapper, 25 gurnard, a mako shark and a kahawai on the boat longlines. We set the two lines twice, with a soak times of about 40 minutes per set. Pictured above is Phil 'shooter' McGavin with a nice six kilogram fish which was our biggest for the day. We also had three others that were about four and a half kilograms each so we finished the morning with quite a bin full. There was a big southerly swell running but the wind were light. It was one of those very fishy days. We were always put off a Kontiki due to the ever present danger of shark bust-offs and the Kontiki floating to South America or Australia. The ShoreThing has put all that to bed and the cost of the ShoreThing is totally justified. 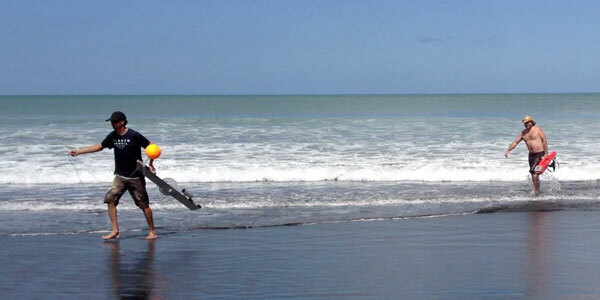 We traveled to Uretiti with our new toys last Friday and proceeded to launch the kit from about 1 km down the beach. The sea was smooth and a decent wind was out of the West. The ShoreThing was an absolute breeze to set up (having poured over the instructions and trialled the reloading a few times at home). The first set was launched and the whole kit took off out to sea at an amazing rate of knots. We had a set at 15mins offshore and needed the binoculars to find it, straight out where the GPS was set for. We then had a visit from a fisherman 600 metres back down the beach to inform us he had probably crossed us as he set his kontiki at a 45 degree angle to his position. I surprised myself at my restraint, but as he was half my size I didn’t have a choice! We then wasted the next hour hauling in and removing the crossover. Beach etiquette was not in this guy’s vocabulary. So no fish that set. Next set was perfect but at the bad end of the tide and no fish. Third set was also perfect at 20 minutes out and caught slack tide and incoming. Left it out for 40 minutes and hauled in to find four very nice, above average snapper on the line. There is some strange, fine, bottom weed out from Uretiti. Another advantage of the ShoreThing is you will only get weed on the hooks when retrieving the line and not dragging hooks/weights through it on the way out. This is a big plus in favour of the system. As the day was coming to an end and I only have three sets of Kontiki batteries, that was it for the day. A lot of fun and, for newbies, a breeze to operate the gear. The ShoreThing is not rocket science to use and re-load so long as you have a play with it in the garage before going to the beach. The other Kontiki fisherman had four small snapper and four shark bitten traces, so he was lucky he didn’t lose the whole kit. Out of interest, two observations. If we had read the instructions properly where Paul states to remove the old baits after a set and not reuse them, (we trying to be tightarse) the second reload would have been easier!. And from starting to haul in (1.5 km’s of mainline) to reloading and re-setting the gear was 1 hour. More than acceptable. Thanks for spooling the fishing reel with spectra. Here is a photo of my son with one of the three snapper I caught from my first set at secret east coast location last Saturday. We have a new Flounder Spearing Light. The new lights are brighter, have a wider beam angle and they are powered by the best battery in the world (Genuine Panasonic 3100mah 18650NCR). They also have a magnetic switch (a vast improvement from the old lights) and are waterproof to 10 meters. We will be making a new video of the lights soon and will update the pics on the website. Ring Morgan Ph 09-6345005 for more details or to Order the New Lights Here. The Fish Are There - Are you Ready For Them? The Fish are already in on the West Coast. Evening kite and kontiki fishing on the East Coast is picking up and the water is warming. In a week or two inshore snapper numbers will start build up in preparation for the spawning season (some snapper are full of roe now). Boat longlining is already firing and the flounder spearing season under way. Nows the time to check your gear and get the spares you need. Feel free to drop in or ring for any advice on any fishing tackle, flounder lights, premium kite and kontiki systems and boat longlines. Paul's Fishing Kites also stock a comprehensive range of general surf and boat fishing tackle and accessories and have a well stocked bait freezer.